Ash Wednesday begins the penitential season of Lent – 40 days of fasting, praying and alms-giving culminating in the celebration of Easter. You can spot the Catholic on Ash Wednesday by the blackish smudge on their forehead. The signing of the forehead with ashes is another strong, Catholic symbol. As a child, the ritual terrified me. We solemnly processed to the front of the church where the priest was waiting with a bowl of ashes – made by burning the previous year`s Palm Sunday branches. 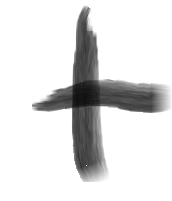 He dipped his thumb in the black soot, and traced a cross on your forehead. The excess specks fluttered across your eyes, cheeks and nose while he intoned `Remember man that you are dust, and to dust you shall return`. The thought scared me too much to worry about the fact that I wasn`t a man! Today, the more inclusive `Remember that you are dust…` is used. Sometimes the words are replaced with `Turn away from sin and be faithful to the Gospel` or something similar. While a good sentiment, it seems tame and sterile compared to the reminder of mortality that had us shaking in our boots. As Eucharistic minister I have been involved over the years in the distribution of ashes on Ash Wednesdays. Many people love the wearing of ashes, it is very important to them. People not involved in Church at all will show up for Ashes, this has special significance to them. I have often wondered what this is all about? There has to be a deeper meaning for some people that I am not getting. Lent for me has always been the Church’s annual retreat. I think the word “lent” means Spring. Ash is dirty, earthy and a good fertilizer. But there is still more here for people than being signed with Ash as a way to reflect on our lives in light of our last days. Is it that people instinctively know that Ash is of the earth, and is one of the most fertile substances on the planet. Ash from my fireplace increases the pace of our growth of the plants in my yard. Is being sealed with Ash also to be given nutrients that increase the pace of our growth? Are people who come to Church for ashes, coming to be nurtured so they can grow? Are they vibrating as creatures of this earth to the ancient rhythms or the earth in Lent (“Spring”). Do they know that now is time to enrich the soil for new growth to occur within them? Is ash more about new life for some people than a reflection on death? Is this why they come to Church for Ashes? Should we let the higher ups in the Church know what is really going on here? What a deep and meaningful reflection on being signed with ash, Ray. I have never heard it explained in this way, and so well. Friends in other parts of the world have told me how important the ritual is for them and others who come specifically for ashes. I wonder why there is such a difference in perception. I wish that it could be presented to us in the way you have just done. It has surely made me re-think Ash Wednesday. Thank you…as always!